The International edition of the New York Times wants you to believe that the art market is in trouble because it is too successful. The usually superlative Scott Reyburn writes a story about success at the top of the art market creating vulnerability in the middle where the auction houses must generate their commissions. The auction houses instead have to make money out of lots in the $50,000 to $5 million range, for which they charge double-digit fees to both the seller and the buyer. This in turn squeezes the profitability of middle-range works that don’t enjoy trophy status. At Sotheby’s on Feb. 12, for example, the 1984 Basquiat painting “Water-worshipper” sold below estimate for a hammer price of £2.15 million; it had been bought by its seller for €2.4 million at an auction in Paris in 2010. Reading that second paragraph, you would think the Basquiat sold at a loss because the paper is comparing Euros to British Pounds. 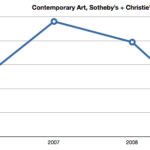 But according to Sotheby’s website, the price of the Basquiat in December 2010 was £2.022m. In other words, the consignor made 7% premium to hammer. Yes, a seller’s commission could have eaten into that gain. But wouldn’t it have been better to convert the prices into a common currency and then make the point that the slim gain might have been eaten up by commissions? Then, again, isn’t the real takeaway from the Water-worshipper sale that a clearly non-trophy work found a buyer?